Delve into the history of one of the world’s most famous motorcycle brands via interactive exhibits, photo galleries, workshops and behind-the-scenes tours. At Milwaukee’s Harley-Davidson Museum, the history of one of the most well-known motorcycle brands in the world comes to life. Find over 450 motorcycles, including famous models and rare custom-made bikes. Tour comprehensive galleries and visit fascinating exhibits tracing the evolution of Harley-Davidson from its foundation in 1903 to the present day. The museum is a must-see for anyone interested in the motorcycling world. Major highlights of the museum are The Harley Davidson Journey and The Motorcycle Gallery exhibits, spread over the museum’s upper and lower levels. On the upper floor, you’ll find bikes, models and photo galleries retracing the first five decades of Harley-Davidson production. Look for the Serial Number One, the oldest motorcycle in the brand’s collection. The lower floor galleries showcase events from the 1940s to the present. Witness the evolution of engine design in the Engine Room, where you can see a reconstruction of the 1940s Knucklehead. Head to the Experience Gallery to sit in the saddle of a bike and enjoy a virtual ride through famous roads in the U.S. Spot custom-made bikes in the Custom Culture exhibit, including the 13-feet (4-meter) long King Kong and a bike used in the film Easy Rider. Don’t miss the opportunity to design your own motorcycle in the interactive Build-a-Bike room. Visit the museum shop to find leather jackets, T-shirts, books, limited edition posters and badges. Become part of the brand’s legacy by purchasing a personalized rivet to be displayed on the museum’s walls. Round out your visit at the Motor Bar and Restaurant, which serves up classic American fare such as burgers and barbecue ribs. The Harley-Davidson Museum is a 5-minute drive from Cathedral Square, in downtown Milwaukee. Plenty of free on-site parking is available. Public buses also stop close to the museum’s entrance. The museum is open daily and entry fees apply, with discounts for children. Check the museum’s official website for a schedule and prices of the various guided tours offered. Spend a day at this sprawling theme park to enjoy an array of thrilling roller coaster rides, a water park and entertainment for kids of all ages. Peruse a vast collection of classic European and American art in this gallery that is housed in a striking modern building. This sprawling animal park houses a wide array of exotic wildlife, and is acclaimed for its conservation programs and educational resources. Enter this neo-renaissance building to discover a library and community education resource, as well as an important heritage center for Wisconsin arts. An interactive journey through local conservation, modern innovation and science, proving that education can be creative and fun. This historical landmark and fully functioning lighthouse offers a great spot for a summer picnic with views over Lake Michigan. These three futuristic domes are a dramatic addition to the Milwaukee skyline and the place to enjoy colorful flowers and exotic plant life. This old mansion showcases a diverse range of paintings and furniture, including one-off pieces of art. Visit this attractive Italian Renaissance villa with elegant formal gardens and an eclectic collection of paintings and decorative art works. Get acquainted with ancient civilizations, space travel and all the mysteries of Mother Nature at Milwaukee’s oldest museum. This compact animal park features a host of exotic species big and small, and a range of kid-friendly amusements and educational resources. Explore this Milwaukee landmark on an informative tour or simply appreciate its ornate Flemish Renaissance Revival architecture from the forecourt park. Take a tour of this much-loved Milwaukee brewery, which serves up 155 years of brewing heritage alongside a range of beer at its historic Miller Valley location. Visit this Franciscan basilica to learn about its Polish heritage and admire the elegant architecture that echoes the design of St. Peter’s Basilica in Rome. Sample seasonal tipples at this state-of-the-art brewery, which was the first in the United States to bottle certified-organic brews and make gluten-free beer. 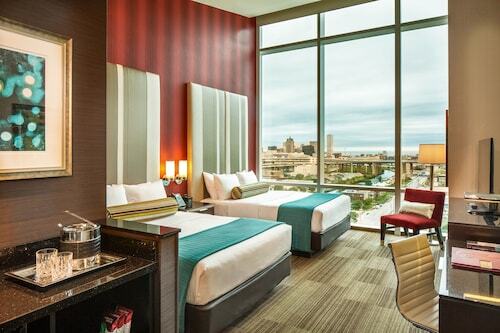 Located in the heart of Milwaukee, this hotel is within a 10-minute walk of Milwaukee Public Museum and Fiserv Forum. Milwaukee Public Market and Milwaukee Art Museum are also within 1 mi (2 km). Milwaukee Intermodal Station is 12 minutes by foot. Located in the heart of Milwaukee, this historic hotel is within a 10-minute walk of Wisconsin Center, Riverside Theater, and Milwaukee Public Museum. Fiserv Forum and Harley-Davidson Museum are also within 15 minutes. Milwaukee Intermodal Station is 5 minutes by foot. Located in East Town, this luxury hotel is within a 5-minute walk of Marcus Center for the Performing Arts and Riverside Theater. Pabst Theater and Milwaukee Public Market are also within 10 minutes. Milwaukee Intermodal Station is 17 minutes by foot. Located in the heart of Milwaukee, this hotel is within a 10-minute walk of Milwaukee Public Museum and Fiserv Forum. Pabst Theater and Marquette University are also within 15 minutes. Milwaukee Intermodal Station is 8 minutes by foot. Located in Fifth Ward, this romantic hotel is within a 10-minute walk of Great Lakes Distillery and Harley-Davidson Museum. Wisconsin Center and Riverside Theater are also within 1 mile (2 km). Milwaukee Intermodal Station is 16 minutes by foot. 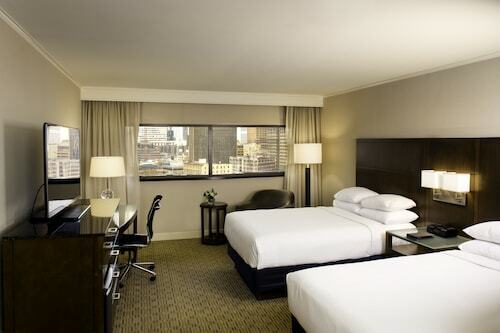 Located in the heart of Milwaukee, this hotel is within a 15-minute walk of Fiserv Forum and Milwaukee Public Museum. Milwaukee Public Market and Milwaukee Art Museum are also within 2 mi (3 km). Milwaukee Intermodal Station is 20 minutes by foot. 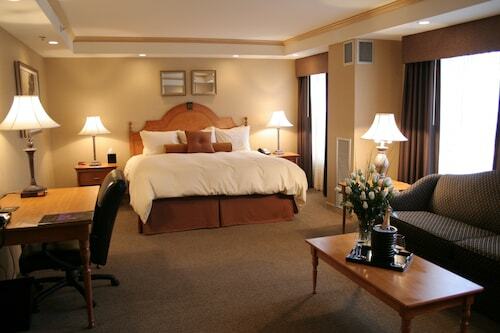 Located in Marquette, this romantic hotel is within a 15-minute walk of The Rave-Eagles Club and Marquette University. Wisconsin Center and Milwaukee Public Museum are also within 1 mile (2 km). Milwaukee Intermodal Station is 29 minutes by foot.